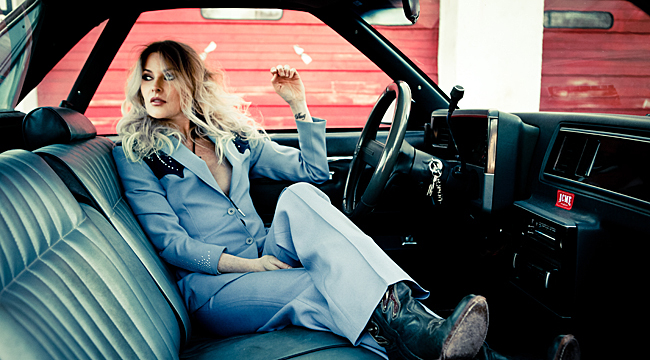 Exodus of Venus, the latest album from singer-guitarist Elizabeth Cook, chronicles the tumultuous past six years of her life. As a result, the songs allude to death, divorce and personal hardships. Cook, who’s performed at the Grand Ole Opry more than 400 times, also hosts her own Sirius XM show on the Outlaw Country station and has worked with everyone from Jason Isbell to Steve Earle and John Prine. NPR Music calls her a “treasure” of the Americana scene and Exodus of Venus appeared on Rolling Stone Country’s most anticipated albums of 2016 list. We phoned Cook at her Nashville home to talk about the album. I read that you had your own band when you were nine. What’s the story there? My parents were both musicians. They played a lot of bars. When my dad quit drinking it wasn’t good for them to be in bars anymore but they still loved music so they kind of made a project out of me. I was horrified. I was young and not naturally inclined to be showy. It’s not my personality. I’m more shy than that. It was tough, but as a kid, you do what your parents tell you. They’re the people who are feeding you and keeping you alive. I learned a lot from it. It was training, for sure. You were born in Florida. At some point did you move to Nashville? I moved to Nashville in 1996, and I graduated college with a degree in accounting. I got a job as an accountant, but I was surrounded by music and it was too tempting not to pursue a different career. The opportunity came pretty quick to write songs and get a publishing deal. Your last studio album, Welder, came out in 2010. Talk about making that record and how it helped widen your audience. It definitely did. It was a turning point for me creatively. [Producer] Don Was had a lot to do with protecting me and letting me come into the studio and do the songs that I wanted to do the way I wanted to do them. I think we came out with a really pure record. Did you feel any pressure to capitalize on its success? Yeah, of course. I did. Right about that time was when I went on David Letterman. We got a lot of TV deals. That was a big distraction. And then on the heels of that, a lot of tragedy started happening in my family and it’s taken a long time for me to get back on my feet. What roles did death and divorce have on Exodus of Venus? I think it’s those experiences that have changed my disposition. I’d been shielded from tragedy for a long time. Once I wasn’t anymore, of course, it changed my experience and my perspective and that affects how I write. I like how the opening song, which is also the title track, opens with an ominous hum. Can you talk about that song and what the title means? It’s a mass exit, which speaks to what we were just talking about. It’s a seismic shift in life and a massive change. The title is about that. It’s an astronomical and astrological and biblical event. The theory is that when Venus passed through Earth’s atmosphere it passed too close, causing what is described in the book of Exodus. I correlated that with being in a new romance. We went to Sound Emporium in Nashville. It’s a wonderful studio on every level. The woman runs it is like a mom to everyone who comes there to work. The studio itself is historic. On top of that, they have everything you need technically to make a really professional record. There’s so much organ on the album. I love it. That’s something new for me. We just wanted great players. One of the great players who is in our psyche right now is Ralph Lofton. He lives north of town. He’s primarily a church guy but we wanted to bring him in. He loves to play. He just played the whole time. That’s why it’s so strongly represented on the record. My producer Dexter Green knows him and had used him on records before. It was super fun to bring him with [bassist] Willie Weeks and [drummer] Matt Chamberlain, who had never met. It was fun and inspiring for both me and Dexter. Did you write the songs all at once? There were seeds of songs that had been written over long periods of time. “Methadone Blues” was written over a long period of time but the bulk of the writing happened over six months. Did a hurricane or flood inspire “Evacuation”? Yeah, Hurricane Katrina. I wrote it years after the fact. I filed away a story about a woman who was told to evacuate and she dug in her heels. It’s sort of like an “I’m not going anywhere” type of thing. It’s a fight-or-flight type of moment. I like the swagger of “Straitjacket Love.” Talk about what you were going for that song. I have deep hillbilly singer roots via my mother from West Virginia. I love to sing that way. I don’t know why I wrote it that way in terms of the tempo change. It just seemed to make sense. There’s an urgency to get what you need and so the tempo changes. Is “Broke Down in London on the M25” based on a true story? Yeah, we broke down on the M25 outside of London. It was the worst. We were on a tour and our tour manager put the wrong kind of fuel in the vehicle. It just froze it up immediately. I suspect the live show is pretty rocking. It’ll be mostly songs off the new record. It’s a four-piece band. The songs on the record are mid-tempo, but they have deep tones and kind of aggressive guitar. Have you started thinking about the next album? I’m thinking about it . . . just thinking about it. Your songs are always so personal, they probably take some time to come to fruition. That’s just my approach. That’s how I know how to do it. I have to get a little bit of life under my belt before I do it again.